The city state of Singapore is one of the most expensive cities in the world, but it’s worth splashing some cash to see all it has to offer. It’s easy to get around the city using trains, buses, and rented bikes, so you’ll be able to explore all the main landmarks in just a few days! A visit to Singapore would be incomplete without seeing its most iconic building: Marina Bay Sands. These three 55-storey towers are home to shops, a hotel, restaurants, and more. They are connected by a 340-meter-long SkyPark at their peak, where you’ll find an observation deck and the world’s largest elevated swimming pool. 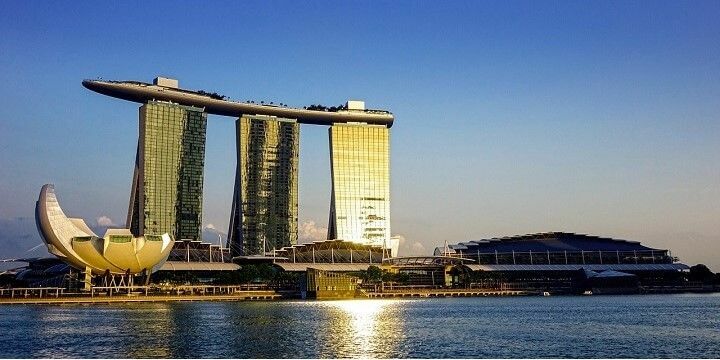 Marina Bay Sands are three 55-storey towers, home to shops, a hotel, restaurants, and more. Be sure to stick around after dark to see Spectra, a 15-minute-long light and water show, with impressive fountain displays and a dramatic orchestral soundtrack. 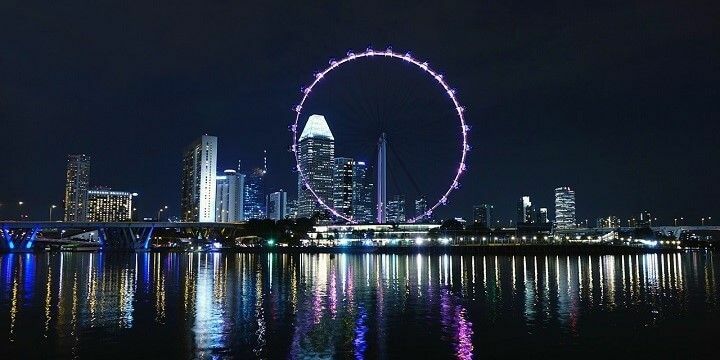 Singapore Flyer is Asia’s largest observation wheel. For the best views of Marina Bay Sands, hop on the nearby Singapore Flyer. Asia’s largest observation wheel will take you on a 30-minute journey, up to heights of 165 meters. Along the way, you’ll see many of Singapore’s most popular landmarks, and potentially parts of Malaysia on a clear day. Singapore’s most popular park is Gardens by the Bay, located next to Marina Bay Sands. Here, you’ll find two huge domes, which replicate different climates. Step inside the Cloud Forest to see a 35-meter-high fountain and plants that usually live 2,000 meters above sea level. Then, explore the Flower Dome, with gorgeous floral displays from around the Mediterranean regions. Afterwards, visit the famous Supertree Grove, home to huge tree structures, covered in over 200 species of plants. Singapore's Gardens by the Bay are located next to Marina Bay Sands. Take a stroll along the OCBC Walkway — the 22-meter-high path that connects the trees — for impressive views over the gardens. The Botanic Gardens also host a whole range of natural beauty. 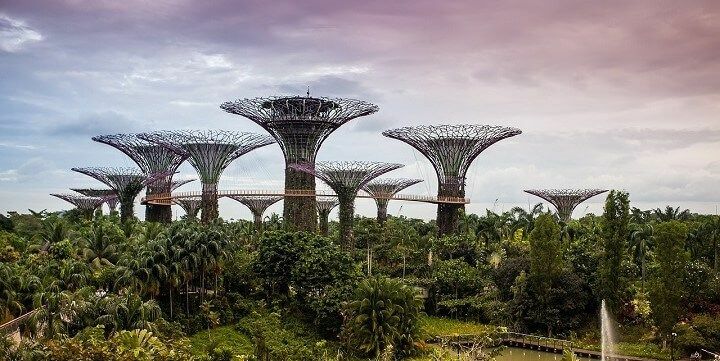 Relax among 60,000 plant species and enjoy free concerts from the Singapore Symphony Orchestra in the country’s first UNESCO world heritage site. 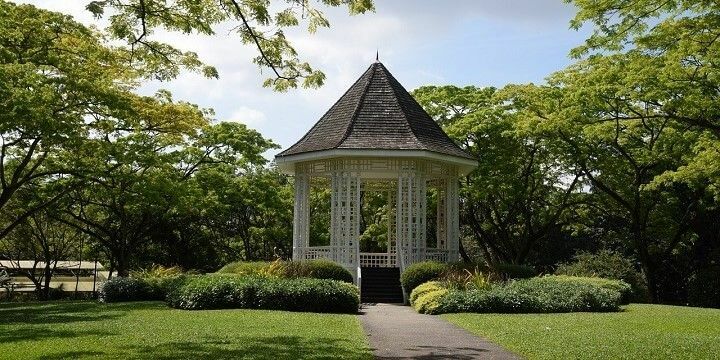 Singapore's Botanic Gardens host a whole range of natural beauty. Be sure to visit Sentosa, a 4.7-square-kilometer man-made resort island to the South of Singapore, home to popular restaurants and beaches. While Sentosa’s beaches are not as impressive as others in the region, it’s still a great spot to escape the busy city. 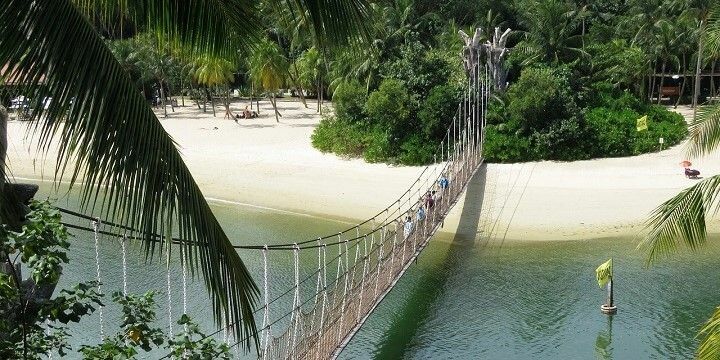 The island of Sentosa is home to beaches, restaurants, and adventure parks. Thrill-seekers will be spoiled for choice on Sentosa. Start by heading to Mega Adventure Park, home to Southeast Asia’s steepest zipwire, an exciting high rope adventure course, and a 15-meter freefall jump experience. Don’t leave the island without visiting Universal Studios. Although this is the smallest Universal Studios theme park in the world, it still boasts over 20 fun attractions, including the world’s tallest dueling rollercoaster! With four official languages and several diverse districts, Singapore is home to a huge array of cultures. 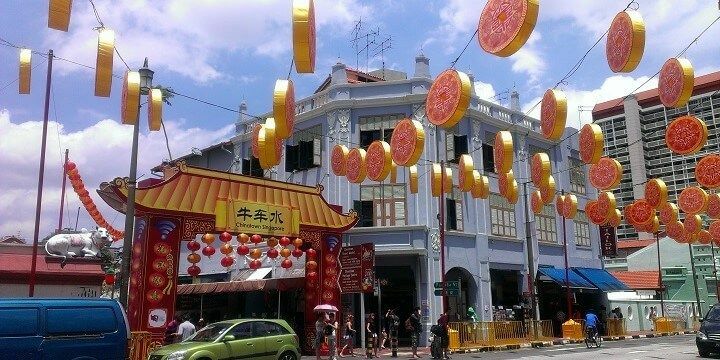 Start in one of the country’s most popular districts, Chinatown: check out its range of Buddhist and Hindu temples, before exploring the Chinatown Street Market for unique souvenirs and tasty street food. Chinatown is home to a range of Buddhist and Hindu temples. Nearby, you’ll find another culturally-fascinating district, Little India, which also hosts beautiful temples, such as Sri Veeramakaliamman, one of the oldest Hindu temples in Singapore. While in the district, check out the Mustafa Center, a chaotic 24-hour mall, which boasts some of the cheapest goods in the country! Finally, explore the Arab Quarter, famous for its huge Masjid Sultan Mosque, which wows visitors with its golden dome. You’ll inevitably be exhausted after seeing Singapore’s sights, but fear not: there are plenty of great spots to grab a cocktail or coffee to re-energize. Haji Lane, hidden away in the Arab Quarter, hosts colorful street art, many relaxed bars, as well as independent boutiques for some retail therapy. Alternatively, walk around Tiong Bahru, the best neighborhood in Singapore for café hopping. 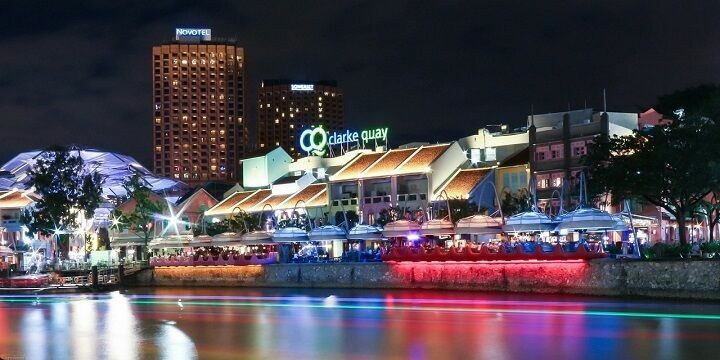 Clarke Quay is a great spot to spend an evening. Take a stroll around the area’s quaint bookshops, boutiques, galleries, and vinyl shops. Clarke Quay is a great spot to spend an evening. This historic area is home to renovated colonial houses, which are now bars and restaurants, where you can find lots of affordable deals on cocktails, wine, and beer. If NextStop24 helped you to choose your next travel destination, we'd be very grateful if you’d search for your accommodation and things to do in Singapore through these links. They're affiliate links, which means that we will receive a small commission for every booking made through them. There are no extra costs for you; you'll simply be helping to keep NextStop24 running. Thanks! Singapore is such a beautiful city. There are so many different things to discover. From sightseeing to shopping over discover nature in different gardens you can find something to do for every type of traveler. A ride on the singapore flyer, a walk in the botanic gardens, a visit of the gardens by the bay with its daily lightshow are a must while staying in the city. Also the food courts are highly recommendable. You can reach most things with a short walk or you can drive for little money with the cab. Definitely the city is worth a visit! The most amazing city I've visited so far, iconic landmarks to see, bustling shops all around, and a top quality selection of food and drink!